A magnet for Corporate Innovation + Startup Collaboration in the Southeast. Corporate innovation leaders spend the morning exploring the current innovation landscape and learning best practices through case studies, panels and workshops. In the afternoon, they are joined by a group of heavily-vetted, B2B startups for curated introductions and brief meetings to explore potential POCs and pilots. Marc Gorlin has been a successful entrepreneur in Atlanta for almost 20 years. Marc founded Roadie in 2014 as the first on-the-way delivery service that puts unused capacity in passenger vehicles to work by connecting people with items to send with drivers heading in the right direction. Working with national brands like Delta, Home Depot and Tractor Supply, Roadie has delivered to more than 11,000 cities and towns across America -- a larger footprint than Amazon Prime. Before starting Roadie, Marc co-founded and was Chairman of Kabbage Inc., which provides working capital to small and medium-sized businesses. To date, Kabbage has raised more than $500 million in funding and has provided over $5 billion in capital to small businesses. Prior to Kabbage, Marc co-founded VerticalOne Corporation, a content personalization service that was sold to S1 Corporation (Nasdaq: ACIW) for $166 million. In 1996, Marc was a co-founder and an original board member of Pretty Good Privacy (“PGP”), a company formed to commercialize one of the most prevalent security standards on the Internet, popularized in the book The Girl with the Dragon Tattoo. Marc assisted with the initial formation of PGP and oversaw the financing, growth and eventual sale of the company to Network Associates in December of 1997. This action-oriented workshop focuses on best practices for kicking-off relationships with startups that lead to fruitful pilot opportunities. A panel of startups with a recent enterprise pilot will be on-hand so you can learn from both sides. Leave ready to develop deeper, faster connections with startups and make the most out of the 1:1 startup speed meetings immediately following lunch. In this (AI powered) interactive session, participants will have an opportunity to look at and discuss some of the toughest challenges facing enterprises navigating AI adoption. Subjects will range across Cultural, Skill, and Organizational Challenges enterprises face on their journey to smart automation. This session will benefit anyone dealing with strategy and logistics of scaling their organizations AI capabilities. A well-written problem statement is key to the success of any innovation initiative. If done right, it will focus your team, remove uncertainty and set the table for rapid progress. If not…let’s not even go there. In this 30 minute workshop, 352 Inc.’s VP of Innovation, Kevin Lewis, and Director of Innovation, Rich Goidel, will show you how to craft a great problem statement. Facilitated using a double opt in method. To participate in 1:1s you must register and opt-in to participate in this portion by October 8th (within this site's registration form). We'll follow up with corporations to learn about what type of discussions you're interested in. Startups also need to fill out a short application. The Gathering Spot is a next-generation private membership club. The club serves as a hub of diverse collaboration, connections and experiences uniquely positioned to build the future of what community looks like. Founded in Atlanta in 2016, The Gathering Spot is expanding to additional cities beginning with the DC location coming soon. 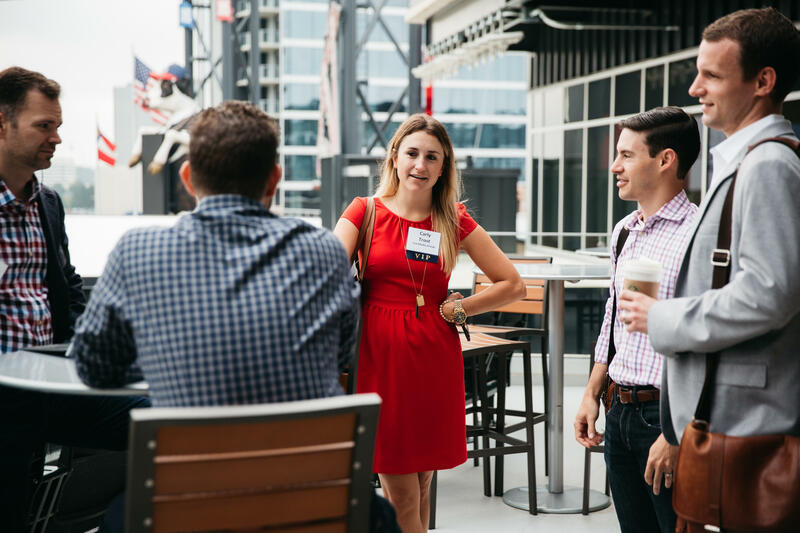 A collaboration between the BridgeCommunity commercialization program and The Metro Atlanta Chamber to coalesce the city’s innovation community around corporate + startup collaboration. + Panel on Innovation Big & Small with Kabbage, Cox Enterprises, IBM/The Weather Company & Coca-Cola Company. "Better Together - A Playbook for How Corporations and Startups can Work Together"
"How Design is the Key Enabler to Corporate Innovation"
"Evaluating a Startup: The VC Perspective"